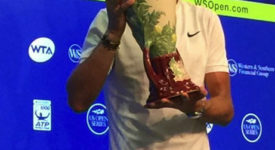 One of the best things about the Western & Southern Open, held last week in Mason, Ohio, is the opportunity the tournament presents to see a large array of talented players—some established, others on the rise. If you are a tennis buff, here are five names to remember as the tennis world now sets its sights on the final grand slam event of the season…. the U.S. Open (Aug. 28- Sep. 10) in New York. 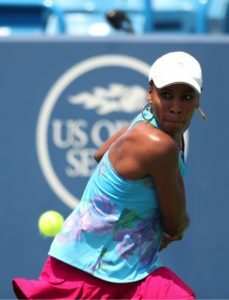 Venus Williams – time never yields! On day one Venus looked great; easily winning her first-round match over Alison Risqué 6/2, 6/1. And for those who may have forgotten—before there was the era of Serena, there was the dominance of elder sister Venus- yes, Venus. It’s been a two-decade ride for Venus and in spurts the ride still rolls along with purpose – evident of her current #9 ranking in the world. But as the sports saying goes – time is undefeated- and it caught up with Venus during her 2nd round match with 21-year-old Ashleigh Barty. It seems the combination of Barty’s talent, the on-court temperatures, her second match in two days, and perhaps (most of all) the 37-year-old number attached to her age was too much for Venus to overcome.  She lost to Barty in the round of 32 (6/3, 6/2, 6/3). Francis Tiafoe- The Next Big Swing in Tennis! If you are looking for the next big swing in men’s tennis, look no further than 19-year-old Baltimore native, Frances Tiafoe. Should Tiafoe continue to progress at the rate he is now, he will be a true force to be reckon with in the coming years on the men’s ATP circuit. Tiafoe possesses a rocket serve, a solid ground/net game, amazing agility and gifted athleticism. Simply stated; Frances is Foe-REAL! 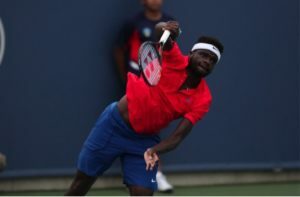 Tiafoe, a wildcard and crowd favorite, surprised the field winning his first two matches, but lost in straight sets in the round of 16 to fellow American, John Isner (7/6, 7/5). 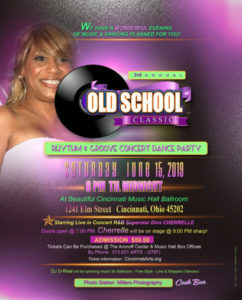 Taylor Townsend – the experience of inexperience! After winning two qualifying rounds Townsend met a road- block in world #2 -Simona Halep, losing in straight sets 6/4, 6/1. 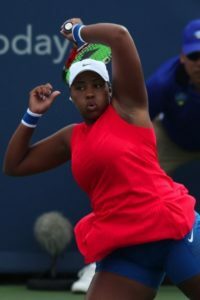 A native of Chicago, Townsend is a talented lefty on the WTA circuit but currently lacks the finesse, speed, and experience to propel herself up the ranks of the competitive women’s field. She’s a tough competitor, and at age 21 her upside is promising. However, for now, she remains a work in progress amongst the WTA elites. Madison Keys- not if, but when? If there’s one player on the WTA circuit to keep your eye on – it’s Madison Keys. The 22-year-old Illinois native is currently ranked #16 in the world. Keys’ rise has been somewhat slow, but steady—and she, like Tiafoe (on men’s side), has all the tools to move up the competitive latter of the WTA, and perhaps be in the running for the keys (pun intended) to the tennis kingdom, once Serena decides to hand them over. But even life without Serena will be tough for Keys, as several top 20 players will be vying for Serena’s dominance as well. With Keys it’s likely not a matter of if, but when? Keys won her first and second rounds matches, but lost in the round of 16 to 2017 Wimbledon champ, Garbine Muguruza (6/4,6/3, 7/6). Every now and then along comes a player that you just have to pause and ponder- asking yourself why? Why hasn’t 24 year old Sloane Stephens (once a top twenty player) been able to consistently stay among the elites, and crack the top-ten barrier; fulfilling the potential many thought she had when she came on the seen as a gifted teen with distant whispers of the next Serena . 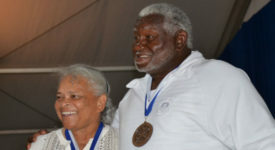 Highly athletic, with speed, power, promise, and personality, Stephens often has faltered right on the brink of success leaving many to wonder if she lacks the experience, or confidence, to excel on the big stage. 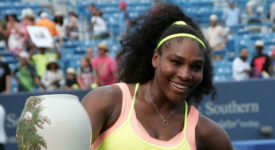 However, after recent foot surgery, and a major dip in rankings, she has reemerged with a purpose; most recently with semi-final appearances at both the W&S Open and the Rogers Cup. 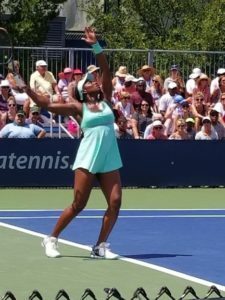 Serving as a wildcard in Cincinnati Stephens stunned the highly talented field, making it to the semifinals before her run was halted by world #2 Simona Halep (6/2, 6,1).